As reported in The Press recently, plans have been submitted to turn this building into a hotel. The once handsome crescent on St Leonard’s Place has for many years (decades?) been occupied by City of York Council. Conversion to a hotel seems a reasonable idea. Anyone who has looked at the building in recent years will know it has been looking shabby, though as I recall it isn’t that long since its frontage was cleaned and the railings painted. Great long lengths of railing, all adorned with gilded bits. Clearly you’d need a fair bit of cash just to maintain them, never mind the building behind them. In the mid-19th century the Yorkshire Club occupied the central part of the crescent and a subscription library occupied the end facing onto Museum Street. Around 100 years ago the street directories show it was occupied mainly by various surgeons, and was numbered 1-9. 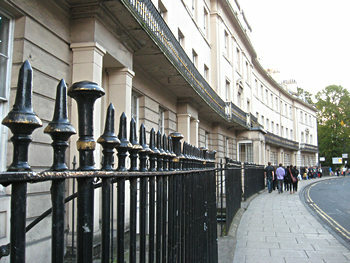 The central part was then known as St Leonard’s Club. In the autumn and winter of 1930 the author Nevil Shute lived at the St Leonard’s Club – as recorded in his autobiography Slide Rule. He recalls spending his evenings here writing – his ‘hobby’. You can imagine him perhaps in a big leather armchair, smoking a pipe probably, writing in a notebook with a nice fountain pen, staring out of the window. It was while he was here that he found inspiration, and the name, for a new and exciting venture called Airspeed. Which soon afterwards set up its first premises, in what most York folk now call ‘that old bus garage on Piccadilly’. St Leonard’s Place will no doubt be beautifully remodelled. It fits into the ‘pre-1850 and pretty’ category, the prevailing aesthetic. Whereas the other stories of this place – the bus garage/Airspeed building, and places like it – seem to have no chance of preservation, not in this city. Slide Rule (preview) via Google Books, and also available to borrow at York Explore/York libraries.